If asked to make a list of tastes that define Kentucky what would you name? Obvious foods connected to the state’s national identity like fried chicken or the famed hot brown would certainly come to mind for many. More regional dishes like bar-b-q mutton, spoonbread or burgoo would have their vocal and passionate advocates. Surely, most of us could at least agree on bourbon. But what about beef sambusas, a cardamom spiced butter cake or steamed momos? Foodies and scholars alike should take note of Aimee Zaring’s new offering, Flavors from Home. 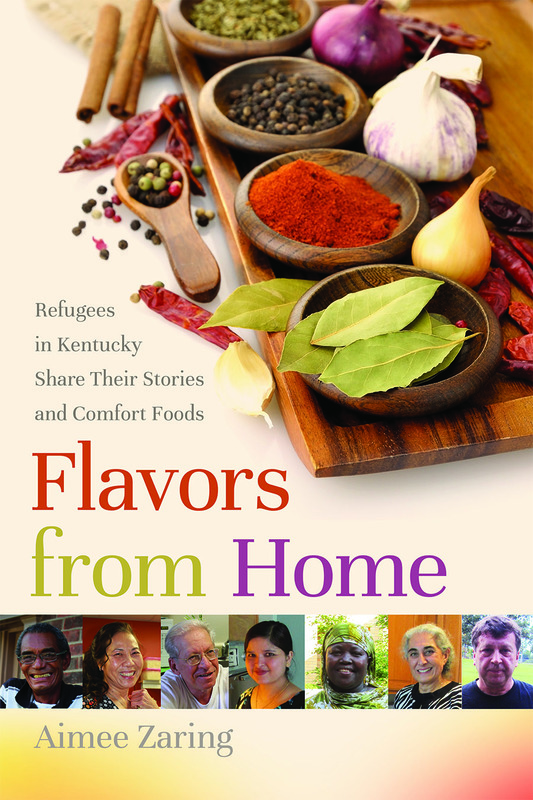 It accomplishes a delicate balance of being both an anthology of compelling stories from Kentucky’s refugee communities and an accessible cookbook with recipes spanning fourteen countries. The book is divided into twenty-three chapters, each profiling an individual or family that came to Kentucky with refugee status. Zaring brings her readers into the intimate spaces of their kitchens where they share stories of struggle, deliverance and resilience through words and food. A total of forty-three delicious recipes were hand selected for their personal meaning. Not surprisingly, they represent some of the best in comfort food from each country. The recipes, like Zaring’s introductions, are substantial and detailed. Ingredient lists are followed by in-depth explanations and notes about the process she gathered while cooking alongside her collaborators. Not all ingredients are familiar and some are not available like the small sour tomatoes of Myanmar in Win Khine’s The Sone Pe Hine (Multivegetable Bean Curry). However, Zaring provides easy substitutes for those hard to find ingredients and demystifies others that might feel intimidating to the novice chef. Chapters also include insightful passages that illuminate everything from the persecution of the Lhotsampas people in the tiny mountain kingdom of Bhutan to the ecological destruction wrought by the irresponsible cultivation of palm oil. Other pieces peppering the chapters tread toward the lighter side like her research into the difference between plantains and bananas. Readers will also find that the book shares an impressive number of resources for better understanding resettlement programs and ways to engage with refugee support organizations. In one chapter, we meet Huong “CoCo” Tran, a Vietnamese refugee who was forced to flee Saigon after Communist troops and the Provisional Revolutionary Government of South Vietnam overtook the city near the end of the Vietnam War. What followed was a long and harrowing journey that separated Tran from members of her family and left her stranded at sea until she was finally able to join her brother in Louisville. CoCo became a business pioneer who has since opened six successful restaurants serving creatively reimagined dishes from her homeland. She has influenced Louisville’s dining scene and introduced many Kentuckians to homemade tofu, curries and popular Asian street foods. CoCo’s vegetarian fair is just as valid as cornbread and pinto beans when considering the state’s diverse foodways. Other stories remind us that the introduction of new foods by immigrants has been one of the only constant traits of Kentucky’s food heritage. Continually in a state of evolution, changing food traditions are evidence of a confluence of cultures. In Eastern Kentucky, the region’s iconic dishes reflect the many people who have and do call the mountains home. Like other Southern cuisines, mountain food blends Native American, European and African ingredients and techniques. During the Industrial Age, hundreds of thousands of Eastern European immigrants came to work in the mines and mills and brought their tastes of home with them. Community cookbooks of that era reflect the mixture of nationalities and reveal an excitingly varied Appalachian table. With that in mind, the hearty goulash of stew meat and winter vegetables offered by Irene Finley, a Hungarian refugee who landed in the small Eastern Kentucky community of McRoberts when she first came to the U.S., seems at home simmering over a hot stove on a cold mountain evening. Zaring’s subject matter and approach is aligned with the contemporary movement to explore complicated issues of culture, politics and identity—especially those of marginalized communities—through the lens of food. Flavors from Home arrives during an especially exciting time in the study of regional foodways. With recent publications from Southern studies scholars Marcie Cohen Ferris and David Shields along with the Studies in Culture, People, and Place series from the Southern Foodways Alliance and University of Georgia Press, the field of food studies dedicated to the meaning of what and how we eat is growing in literature and depth. Zaring’s subject matter and approach is aligned with the contemporary movement to explore complicated issues of culture, politics and identity—especially those of marginalized communities—through the lens of food. At the same time, the book is not an in-depth academic study and remains enticing to the adventurous home cook. Unique to Zaring’s work as a cookbook author, is a measured absence of the glossy staged photography plastered on food blogs and Instagram accounts. Zaring notes that she purposely did not stage photos, but opted instead to include photographs of people engaged in everyday activities from casually cooking with their family to hauling produce in from their garden. The featured dishes are presented on the cooks’ own plates in their kitchen just as they were prepared. This thoughtful detail creates no less striking images and seems honest in a time when the current photo tropes of weathered hands holding seeds and perfectly arranged vegetables on a cutting board reveal the artificial presence of photographers, elaborate lighting and professional food stylists. In her introduction, Zaring states that she also intentionally avoided politics to focus on nurturing common ground between interviewees and her readers. However, her choice to work with the food of refugees is at odds with such a goal. Food is deeply political and issues of power and inequities are inescapable in all of the stories. For example, activist Omar Pernet Hernandez served a total of 22 years in jail as a political prisoner for involvement with human rights and democracy efforts in his native Cuba. Even though Omar was forced to flee, he is homesick for his country and the family he had to leave behind. His rich Dulce de Mango (Mango Dessert), one of three recipes he shares in the book, is accented by stories of frequent hunger strikes in prison protesting his unlawful incarceration and abuses by the Cuban government. Indulging in the dessert it becomes nearly impossible not to reflect on the relative freedom and embarrassment of riches we are privileged with in this country. Going home is not an option for the Kentuckians featured in Flavors From Home, but as Zaring illustrates, the kitchen is a safe space for those she profiles and their comfort food a way to connect to memory, heritage and a sense of belonging. Her ability to listen and translate, skills she honed as an ESL teacher, offer personal narratives of heartbreak and resilience in a way that cultivates compassion and creates a very special collection. Zaring’s book not only foregrounds the experiences of refugees in the Commonwealth, it subtly asks us to consider our appetite for supporting diverse and inclusive communities. Lora Smith is a writer, farmer and advocate. She is a co-organizer of the Appalachian Food Summit and has written articles on Southern and Appalachian foodways for national and regional publications. Lora lives on a small organic farm in Eastern Kentucky where she helps raise hemp, heirloom vegetables and two children.